The Queens Birthday long weekend was approaching and we talked about getting away but hadn’t decided on a destination when Em’s sister mentioned that she was heading up to the High Country to take their kids on their first ever camping trip. We decided to tag along. Corry and Brendan headed up on Friday night, but we left first thing on Saturday morning. It was an easy 3 hour or so drive from Melbourne to Porpunkah and then a little way along Buckland Road to the campsite called AH Youngs. 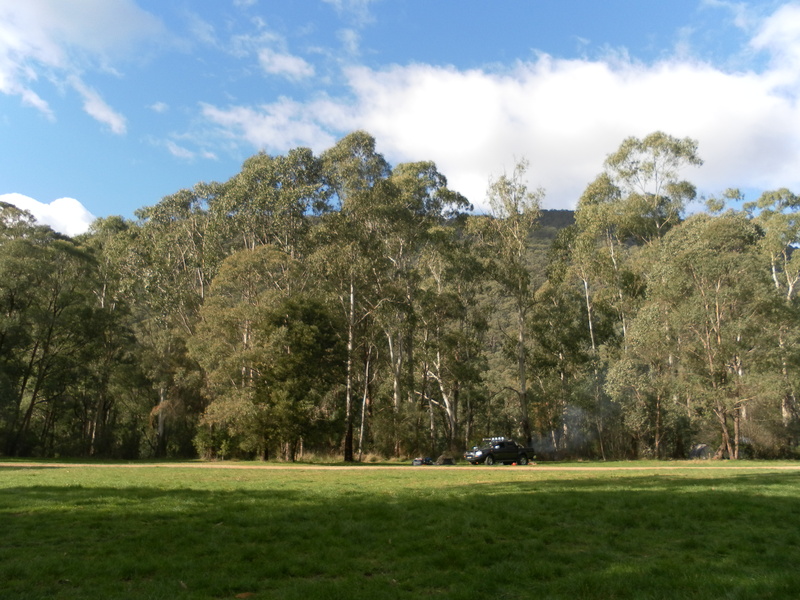 This camping area is run by the Victorian Department of Primary Industries (DPI). It is a large flat shaded and grassy area with plenty of space for everyone to have their own quite corner. There are fire pits provided around the site and a set of drop toilets. It’s also a dog friendly camp site, so we were able to take our four-legged friend Buster with us. Although it was supposed to be the opening weekend of the snow season, owing to the very mild weather we had been experiencing throughout May, there was no snow to be seen. Even some of the deciduous trees still wore their dressing of colourful leaves. After arriving and setting up camp we had a bit of lunch before taking a short exploratory stroll down to the river. Then Craig and Brendan took Hamish to ride his motorbike and collect some firewood while the girls stayed at camp with the youngest kids. Dinner was provided by Corry and Bren in the form of a leg of lamb on their neat little spit roast thingy along with some potatoes cooked in the coals – delicious! Corry and Bren were originally going to head home on the Sunday, but decided to stay an extra night. Not having brought enough supplies for an extra day, we decided to all head to the Snowline pub in Harrietville for Sunday lunch. Despite there being a slight chill to the air, there was no room on the outdoor deck for our group so we headed inside. There was an old style arcade table, so we gave the kids some dollar coins to keep them occupied while we looked at the menu. Unfortunately they weren’t quite old enough to get the hang of it so that plan kind of back fired! Lunch came and we all enjoyed our meal (the others had a parma, while Em had a burger – delicious!). The chips for the kids were great, but the chipotle mayo was a little too spicy for them so we had to ask for tomato sauce. A short drive down the road is Pioneer Park along side the Ovens River. The dogs had a great time chasing the ball and even though the water was freezing they went in for a swim! The kids enjoyed stretching their legs on the play equipment while Corry and Em popped across to the bridge to the café to get some coffee. Craig and Emma headed straight back to camp to get the fire stoked and dinner underway as it was our turn tonight. Meanwhile Corry and Brendon popped into Feathertop Winery. Located in a gorgeous setting, this place is highly recommended for the amazing view, stylish décor and of course the wine. A case of their finest made it into the boot of their car for further tasting later that night. The next day of course was Monday and it was time to pack up and head home. All in all it was a very pleasant weekend. There are plenty of things to do the High Country – fishing, hunting, bushwalking/hiking, motorbike riding and driving some of the four wheel drive tracks to name a few. We’d definitely recommend visiting in autumn when mother nature puts on a show and next time we’re in the area we’ll visit Bright Brewery. Em sampled some of their cider while at the pub and thinks it warrants further investigation! Previous Post Why Hit The Toad?